GEM rice parboiler, attracted a lot of interest; so did the cassava confectionery—cakes, chin-chin, tidbits, cookies, “sneh” balls—rice products and other sundry products. Akinwumi Adesina (center) samples SARD-SC cassava products. Project publications on the four commodities also attracted interest. Visitors thronged the stands to read and learn about the achievements of the project in all areas innovations. 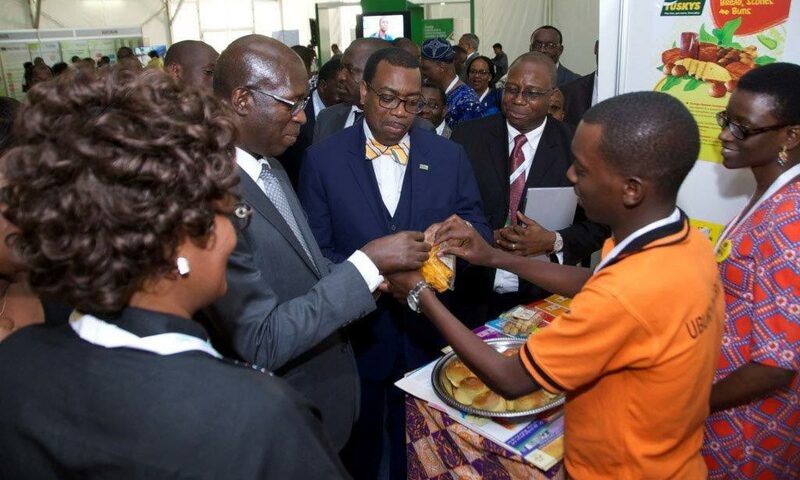 People who visited the stands liked the cassava snacks on display; they were amazed at the new cassava products. Some of the visitors who tasted the products were totally surprised to know that such products could be made from cassava flour. Nsanzabaganwa Emile, General Manager, Kinaazi Cassava Plant, asked if IITA could train his staff in preparing cassava confectionery. Hilda Vasanthakaalam, Dean, School of Food Science and Technology, Nyarugenge Campus, Rwanda, was one of the visitors. She commended the project for the creativity in the cassava products. She was especially interested in the confectionary made from cassava flour. “It is amazing to see these snacks made from cassava flour. These are good,” she commented. The three-day exhibition attracted hordes of people. The exhibition was convened by three CGIAR Centers; IITA, AfricaRice, and ICARDA. These centers are implementing an African Development Bank (AfDB)-funded multinational CGIAR-led project, Support to Agricultural Research for Development of Strategic Crops in Africa (SARD-SC).